For a training purpose I was trying a basic demo on fault contract in WCF and to be surprised I Got below error while throwing FaultException. It’s not that 1st time I was working on Fault Contract but this error was irritating. After some investigation I found there was some issue in visual studio 2013 setting. So to solve this in Visual Studio go to Tools->Options. 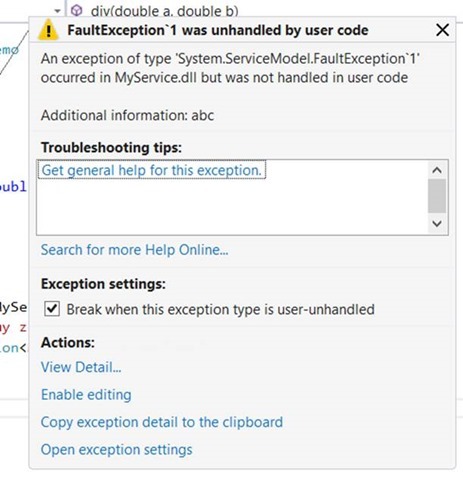 Changes in Visual Studio setting should solve the problem. Keep in mind that above error can occur due to other reasons also. Visual setting debugging option may be one way to solve above said error. I hope you find it useful. Thanks for reading. Can we have multiple endpoints with same signature ?